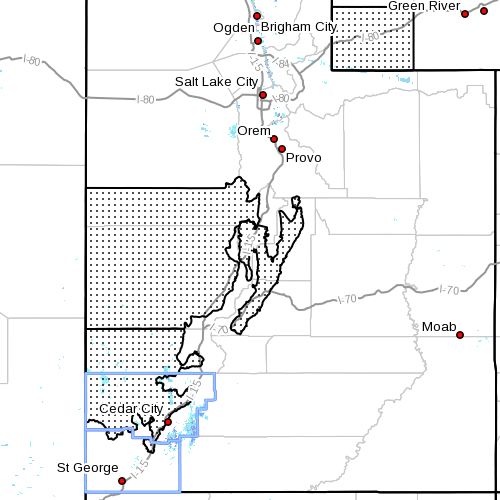 SOUTHERN UTAH – The National Weather Service in Salt Lake City has extended its winter weather advisories issued Saturday with some revisions. This advisory is for snow and is in effect until 10 a.m. on Sunday. • Affected area: The Sanpete and Sevier valleys, west central Utah, southwest Utah and southwest Wyoming, including the cities of Manti, Richfield, Delta, Fillmore, Beaver, Cedar City, Milford, and Evanston. • Snow accumulations: Up to 2 inches of additional snowfall through this morning. • Timing: Snow showers will continue to dissipate through the morning. • Impacts: Winter driving conditions can be expected through the mid-morning hours. Not mentioned in the morning advisory but included in last night’s advisory in particular were area roadways including Interstate 15 and Interstate 70 and U.S. Highway 89. • Precautionary/preparedness actions: A winter weather advisory means that visibilities will be limited due to a combination of falling and blowing snow. Use caution when traveling especially in open areas. Visit UDOT’s Road Weather Alerts / Obtain UDOT’s smartphone travel app.